In some ways, mountain ranges are like icebergs bobbing in the sea. The tallest icebergs have the largest underwater counterpart and the highest mountains have the deepest crustal roots. The southern Sierra Nevada in California, however, has an anomalously thin crust. Using seismic imaging, geologists have linked the missing crust to a nearby region where the mantle is sinking. The research highlights a unique mountain-building process and helps explain the Sierra's stunning topography. "What we found is that the crustal structure doesn't follow the surface physiography," says George Zandt, a geophysicist with the University of Arizona in Tucson, and lead author of the study, which appears in today's Nature. "Normally, you have the greatest thickness underneath the tallest mountains  in this case the eastern Sierras," he says. Instead, "we found the maximum crustal thickness in the western foothills." Temple Crag displays some of the famous Sierra Nevada granite. 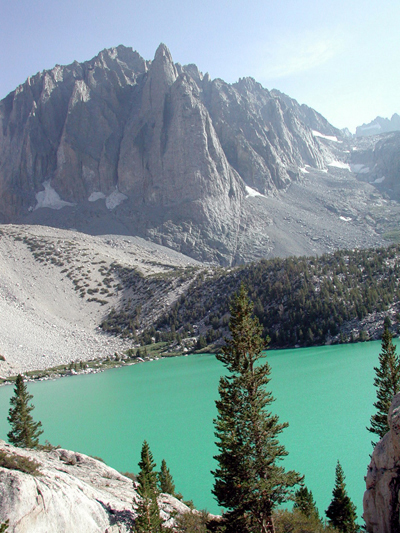 The highest peaks in the Sierras are located along the eastern edge of the mountain range. Geologists suspect that inflowing mantle material in the east is repsonsible for some of the range's spectacular height. Image courtesy of Mihai Ducea, University of Arizona. The researchers determined the thickness of the crust using receiver function seismology. The technique is similar to reflective seismology (which uses artificially generated seismic waves to image Earth's subsurface), but it uses naturally occurring earthquakes, Zandt says. With this technique, they observed that something was missing: the Moho, a seismic discontinuity named after the Croatian seismologist Andrija Mohorovicic, that marks the boundary between the bottom of the crust and the top of the mantle. In the Sierra Nevada, the Moho is usually located about 35 kilometers beneath Earth's surface. But when researchers looked at the western foothills southeast of Fresno, "we were no longer able to identify where the Moho was present," says Hersh Gilbert, a co-author and seismologist at the University of Arizona. The researchers suspect that a previously discovered region of mantle downwelling  a so-called "drip"  is responsible for the missing Moho. Geologists believe that the Sierra Nevada drip began less than 10 million years ago, in the late Cenozoic, as the dense root of the mountains began to tear away from the lighter granites in the crust and descend into the mantle. Like jettisoning ballast from a ship, the removal of heavy crust promotes uplift. The drip partly explains "why the Sierras have gone up in the past 5 million years or so," Zandt says. The drip may also explain some other interesting surface features. The drip originated underneath the tall eastern Sierras, but has since sheared off to the southwest and is now centered underneath the western foothills, Zandt says. As a result, the drip is pulling down the crust and causing local subsidence. "There is faster sediment accumulation in this basin than in the surrounding area," Gilbert says. "We also see a change in the drainage pattern  nearby rivers and streams are being drawn into the subsided area." As the drip moves off to the southwest, new mantle material is flowing in to take its place, Zandt says. He suggests that the inflowing material is pushing up on the eastern side of the Sierras and may contribute to the great height of the mountains such as Mount Whitney, the highest point in the continental United States. 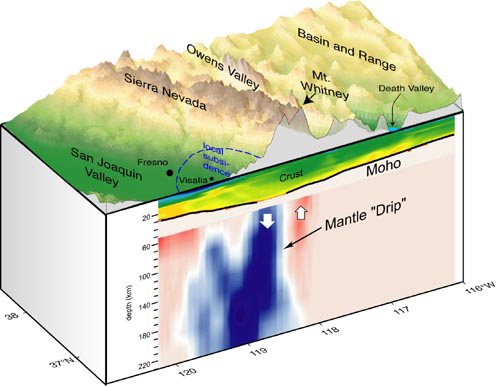 In the western foothills of the Sierra Nevada, a portion of the lower crust is "dripping" (or sinking) into the mantle. The drip is causing land subsidence (outlined in blue dash marks) in the San Joaquin Valley. Inflowing mantle material, shown in red, is pushing up on the eastern Sierra Nevada and may be augmenting volcanism and extension in the Owens Valley, adjacent to the Basin and Range region. Image courtesy of Hersh Gilbert, University of Arizona. The hot, inflowing mantle may also contribute to recent volcanism and extension in the Owens Valley area, just east of the eastern Sierra, says Oliver Boyd, a geophysicist at the University of Colorado, Boulder, who recently imaged the drip in the July 30 Science using a different seismic technique. He says that he agrees with most of the new research by Zandt and colleagues, but proposes a slightly different mechanism and geometry. Boyd suggests that the drip actually looks like "paint cracks that are starting to peel away from the side of your house." The dense crustal root is delaminating from the upper crust, he says, like unzipping a zipper. "In the other model, the paint is like syrup that pools and drips." Both research teams think that more seismic data will help to resolve the drip structure. "There are almost no seismic stations in the Great Valley," Boyd says. "It would be very useful to get stations there and in the north." Geologists do not know if the drip in the southern Sierras has occurred elsewhere in the mountain range. The drip may have already occurred in the north, or it may be happening now, Gilbert says. The recently reported deep-seated earthquakes in the Lake Tahoe region, he says, may be related to the shearing off of dense crustal material, like the southern Sierra Nevada experienced roughly five million years ago.